If you’d like to share some kind words and smiles, please review us on Google Reviews, Healthgrades, or write us personally. We’d love to hear about your experience! I want to sincerely thank you and your staff for helping me regain my life. Since being diagnosed with scoliosis at the age of 14, I knew corrective surgery was not a personal option for me and that I would live my life with chiropractic, massage, and supportive care. I was relatively pain-free until October of 2010, when I went for a minor procedure at the dentist and my jaw was overextended for too long and I was left with neck and shoulder pain for a long 20 months. I tried chiropractic care, went through bottles and bottles of Biofreeze® and Icy Hot®, acupuncture, all just to get some form of relief. I was internalizing the pain, which made me angry to my loved ones. Then I was researching neck pain and came upon the topic of TMJ disorder. I did not have the typical signs (jaw pain, clicking or popping with chewing, etc. ), but I researched more in depth and found that it's a common co-morbidity with scoliosis and neck pain. I asked around and multiple people told me that Dr. Baba is the best and that I need to go see him. I made an appointment and have never looked back. 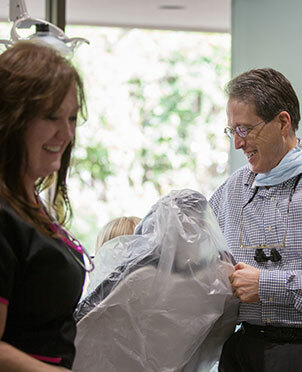 “When I was referred to Dr. Baba by my previous dentist in South Carolina, I thought my dental health was as good as I could achieve. During the initial evaluation, Dr. Baba asked if I had any pain associated with my teeth or jaws. At the time I thought this was a general question. When I stated that I did not have any noticeable pain, Dr. Baba asked if I would like to listen my jaws when opening and closing my mouth using the stethoscope. I knew that I had some noise when my jaws moved but I was not prepared for the grinding and crunching sounds which came from both jaw joints. Dr. Baba explained the issues he detected during his examination and then I had the opportunity to see for myself in the X-rays how my upper and lower jaw were out of place compared to healthy joints. I appreciated that I was given the information about treatment options with no pressure to make a decision, and was given all the time I needed to think about what I wanted to do. When I finally got past my fear of starting what had been clearly laid out as a long process and started the treatment plan, the first appliances (one I wore during the day and a different appliance at night) resulted in an immediate change: the first night I slept better than I could ever remember. Another miraculous result was learning/realizing that I had been living with a lot of pain and pressure in my face and head and now that pain was gone. Because I had lived with the pain all my life, I thought what I had been feeling was normal. After the first 24 hours of treatment, there was no turning back. I knew that I could not go back to my old normal. Having that pain eliminated changed my life, changed my perspective about life. It was like a great weight was lifted off of me. Given the amount of work needed to bring my jaws and teeth into alignment, it required a bit of patience and perseverance. Remembering where I had been before starting on the work to align my teeth and jaws made it easy to keep following the treatment plan. It has been well worth the time and expense to get my dental health to where I am today. “I was in need of prompt attention for an infected tooth. Dr. Joe took care of that. In follow-up appointments, Dr. Joe quizzed me about my bite, jaw pain, and sleeping habits. My answers to those questions led to using the sleep monitor. It showed I did have sleep apnea, and wasn’t getting restful sleep. We discussed my options, and I decided to use the TAP appliance. It took some time to get the position right. That led to much better sleeping and less snoring. My wife and I hadn’t slept in the same bed for many years because I snored so loudly. We tried it and I made her promise to wake me if I snored. She hasn’t had to yet. After a couple of months, I felt like I wasn’t getting the same rest as I had become used to. It wasn’t as bad as before the appliance, but not as good as it had been. I had an appointment with Dr. Joe. He felt I needed a different position on the mouthpiece. I used to bite the edges of my tongue and cheeks at night. They would be sore obviously, but my tongue became very sensitive to some foods. There were days I couldn’t tolerate ketchup. The mouthpiece doesn’t allow that to happen, and I believe because of that, my tongue is no longer sensitive to food. Thanks so much for all the time you have put into my treatment. I feel so much better now. It is totally amazing. When I first came to see you, I had been to numerous doctors, ENTs, and dentists trying to find a solution to my problem. They all told me that there was no problem and any symptoms I had I would just have to learn to live with. Just talking to Denise on the phone the first time she made me feel like she knew what I was talking about and that you guys could really help me feel better. This has been quite an undertaking, and to be honest there have been some stages of the process that I hated, but it was totally worth it to get to where I am now. When I first came to see you, I was in a very deep depression and my husband was extremely concerned about me. I had tremendous headaches and neck pain, severe jaw pain I felt like I couldn’t even hardly eat, and the noises in my ears was unbearable. That was in November of ’07. I got my first splint in January of ’08 and within a few weeks started feeling some relief. It did take me a while and a lot of extra work on your part to get the neck pain to go away. “The best thing I have done for myself, after ALL these many years of suffering: drugs, drugs, and many lost hours in the dark with migraines. Finding Dr. Joe was a miracle for me, as I now feel like I have a ‘relaxed’ face, mouth, tongue, cheeks, jaw, head, neck, etc., and I’m on the way to recovery and a full smile that does not hurt when I chew, talk, yawn, or eat (just some minor pain of dealing with wires, rubber-bands, and a plastic splint); small in comparison to years of too-many-to-count unsuccessful healthcare professionals that tried, but couldn't quite hit the solution to my situation. When I was younger (before my face was grown), an orthodontist of years past felt it his duty to pull several permanent teeth, which, much to my dismay, I feel caused my mouth to cave in, and cause MUCH stress to my TMJ joints. Compiled with years of graphic design, painting, grinding, stress, and a tonsillectomy when I was 30, which resulted in two emergency bleedings and a couple of jaw-breaking experiences, I have been to every doctor under the sun to get a handle on constant headaches, pain in neck, back, etc., ... The neurologist liked to try every painkiller available; the TMJ specialists in Florida thought my problem would go away with splits in my shoes, since after all the years of trauma, one leg was two inches shorter, due to the constant stress of muscles spasms from my jaw, face, neck, back down to my legs; the orthodontists in Missouri tried splints, to no avail. I have been to acupuncture, alternative healing, etc. I finally found that yoga was helpful, but now, that combined with Dr. Baba’s plan for me, I am feeling like a new woman! I would encourage anyone who is suffering from TMJ to confidently trust in Dr. Joe’s ability to get to the core of the problem. He is diligent, persistent, and thorough, and truly CARES about how you are doing, what you experience, and he learns from each of us to better help the next patient. Has this experience been easy? No. Have there been times when I was frustrated? Yes. Have I felt a bit embarrassed or awkward? Yes. Did I still have painful days and nights? Yes. Have I worried about the finances? Yes (though there are great ways for loans and payment plans). Would I go through it all again with Dr. Baba to get where I am now? YOU betcha! “In January of 2002 I was diagnosed with throat cancer and had to undergo radiation and chemo therapy. Due to that, my teeth eventually became brittle and began to break off; however, it was not a gradual process, it happened abruptly. This began in June of 2005. I contacted some of the dentists in Wichita and the soonest I could get in to even see them was in November. Due to my emergency condition, it was not possible or good for my health to wait that long. I contacted Dr. Baba’s office and explained my situation. They made arrangements for me to get in immediately and make me a set of dentures that would be ready for me to install right after surgery. This was very important. Due to the condition of my gums, the dentures needed to be put in as soon as my teeth were extracted. Dr. Baba and the ladies at his office made it happen. They were so wonderful to make special appointments and accommodate me. At about the same time, I discovered a company that would be able to install a mechanism in dentures that would enable me to communicate. Dr. Baba contacted them and made arrangements to make the dentures for the voice prosthesis. This is an unsolicited letter from me to you describing my honest feelings about the great benefit of processing a good set of teeth at an advanced age. I am now 97 years of age and still proud of my teeth. I am able to eat anything I wish, exactly as I did in my youth. I am not troubled with removable dentures. At the age of 87, as you well know, I spent $20,000 to fix up my teeth, hopefully for life. I am now 97 and except for the recent removal of one tooth which had been repaired at least ten years ago, I’ve had no repairs to my teeth and I feel I have a full set of teeth of which I'm proud. I fixed up my teeth so I could eat whatever I wanted, for my health and my appearance is the same as a young man’s. I strongly advise that everyone pay attention to his or her teeth for best health and appearance throughout life. It is a relatively small cost to achieve very great benefits. “First, all dentists are not created equal, and there’s good reason that ‘dental malpractice’ is a part of the legal profession. Second, there are quite a few dentists that participate with Delta, but the vast majority are not ‘comprehensive’—rather, they’re what I refer to as ‘cleaning and filling’ dentists. Third, the few Delta dentists that do more than the basics are extremely busy (which doesn’t necessarily mean that they’re good). What we wanted was basically a second opinion, and to see what we’re having done by our dentist would cost if done with a Delta participating dentist. We found that we’d have to make an appointment, and basically start all over. No dentist would simply take the plan from our dentist and price it; they wanted to do a whole new workup, which would have meant spending money and most likely six months’ time, and almost assuredly have ended up right back where we started. Dentistry is not something to go cheap on! Angie had orthodontic work done back when she was in her teens. They lived in Tipton, Kansas, and the dentist actually traveled from town to town (sounds like something out of the Old West). Long story short, we’re now undoing a lot of what was done then, and adding teeth back that were pulled then. You can see why this is an emotional topic with us, and especially with Angie! The final effect of our checking around was that it relieved me regarding the money we’re spending with our dentist. I’m now comfortable with it, and understand that we might be able to spend less with someone else, but are just not willing to take the chance that we’d get less than the absolute best in the compromise. Having survived a nightmare experience with a dentist in the 50s—yes, I even remember the 30s—it’s really a joy to let you all know what my experience has been in your office. From day one, you won my trust. I found an ambiance of professionalism that was apparent at the front desk and extended throughout the office. Strict adherence to cleanliness and sanitation is so obvious I even hesitate to mention it and yet it’s so appreciated. Not only do I find assurance in the fact that Doctor Joe is outstanding in his knowledge and expertise, but everyone on the staff carries out their duties with the same confidence and competence, all the while making me feel special. “During the spring of 2004, I started developing pain in my left jaw when I was chewing or biting. It became so severe at times that I could only eat very soft food. Chewy food, such as steak, and very crunchy food, such as hard crackers, were impossible to eat. Because I was pregnant with my third child at the time, however, I decided to wait until after the baby was born to see a dentist or doctor about it. In November of 2004, when the baby was about three months old, I began having a metallic taste in my mouth. It was so strong that it was worse than the jaw pain I had been experiencing. I did go to my regular doctor about the metallic taste, and while I was there also told her about the jaw pain. She and all the doctors I subsequently saw assumed the jaw pain and the metallic taste were related. As it turned out, they were not. The metallic taste was caused by a sinus infection, but it took many months and many misdiagnoses to arrive at this conclusion. I did discuss TMJ with my family doctor on my first visit, but she pressed on my left jaw and because that did not cause pain, she said it absolutely was not TMJ. She said the pain and metallic taste were most likely caused by an abscessed tooth, prescribed antibiotics, and referred me to a dentist. The dentist in turn prescribed another antibiotic. When this did not solve my problems, I subsequently went back to my regular doctor, my dentist, a doctor of internal medicine, and an ear, nose, and throat doctor, none of whom could figure out what was wrong with me. I had two CT scans and a bone scan and was prescribed a total of eight different antibiotics during that winter. Finally, I was referred to a neurologist who ordered an MRI to rule out MS, which sometimes causes a metallic taste as one of its symptoms. Thankfully, I did not have MS, but the MRI showed that I had a severe sinus infection, which had been causing the metallic taste all those months. So, in March of 2005 my family doctor prescribed the correct antibiotic and I got rid of the sinus infection and the metallic taste. “From the moment that you call or visit Dr. Baba’s office, you know that the experience will be a good one. I had not been to see Dr. Baba before my family did, and my wife had sung high praises of him and the staff. When I did make my first appointment I realized what she was talking about. Everyone on the staff, from the reception and scheduling to hygienists and assistants through Dr. Joe himself, are very friendly and genuinely concerned with me and with good care for my mouth.